Seattle Hockey Team Wins Approval From NHL The league's Board of Governors unanimously approved the city's bid to become the 32nd active franchise in the NHL. The team expects to take the ice for the first time in 2021. NHL commissioner Gary Bettman (center left) presents a jersey with No. 32, signifying that Seattle is soon to be the NHL's 32nd active franchise. The NHL Board of Governors announced the expansion Tuesday. 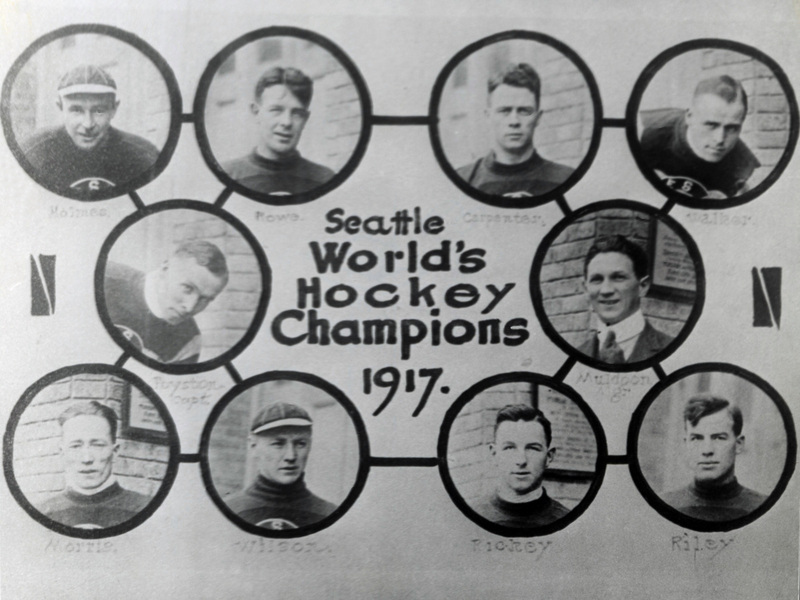 Believe it or not, Seattle already has its place etched in ice hockey history. Once home to the erstwhile Metropolitans, the city was the first ever in the U.S. to hoist a Stanley Cup — though, since that feat was achieved in 1917, it's unlikely more than a few people living today (if any) were actually around to see it. Now, nearly a century after the Metropolitans folded, Seattle natives will finally get a chance to see a band of hometown heroes pursue Lord Stanley's legendary trophy again. On Tuesday, the NHL's Board of Governors announced that it had unanimously approved the city's bid to become the league's 32nd active franchise. The expansion team will get to take the ice for the first time in 2021. 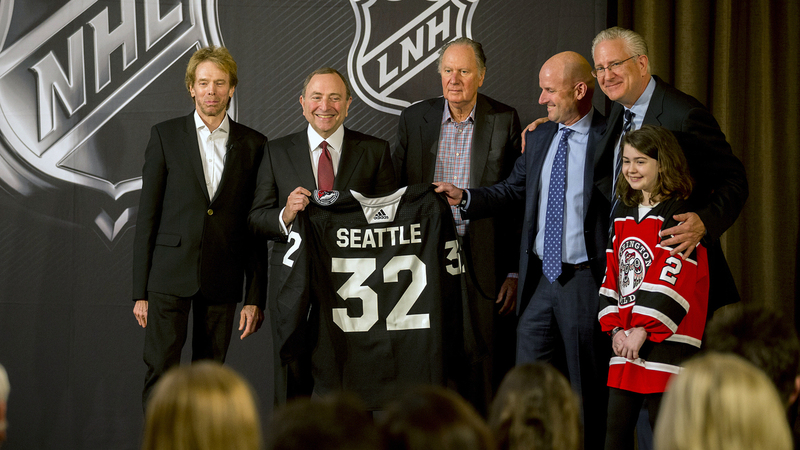 "Seattle, the NHL is thrilled to welcome you," league Commissioner Gary Bettman said at a news conference. "I know, obviously, that those words are the words that the passionate and patient fans in Seattle have longed to hear. So today is a day of celebration, in a great city that adores and avidly supports its sports teams." The announcement caps years of speculation that the Northwest city would be getting a team of its own — speculation that only picked up steam around this time last year, when the league agreed to consider an application from a group headlined by Hollywood megaproducer Jerry Bruckheimer and investment banker David Bonderman. It appears that the group's success will not come cheap, though. The new owners committed to a massive renovation of the arena proposed as the team's home rink, a project costing on the order of hundreds of millions of dollars. The City Council approved the plans earlier this year, and builders expect to break ground on the project Wednesday. "The expansion fee for the Seattle franchise is $600 million, as has been widely reported," Bettman said, "and when you include the cost of reimagining and building Seattle Center Arena, this is a transaction with a value of approximately $1.4 billion." Take a gander at history. Here's the roster of 1917's Stanley Cup-winning Seattle Metropolitans. The Seattle franchise will hope to follow closely in the footsteps of another expansion team, the Vegas Golden Knights, which achieved a minor miracle on ice last year. The club defied every reasonable expectation by making the Stanley Cup Final in its first year of existence. Before Vegas' storybook season, it had been decades before an expansion team had even made the playoffs in its inaugural year. And though Vegas ultimately lost to the Washington Capitals, the team first got to scare the living daylights out of bookies who had underestimated them back home on the Strip. Seattle probably shouldn't count on, or even dream of, repeating that kind of historic success in its inaugural season. Still fans — and some players — daydream about a possible mascot and uniforms, neither of which has been finalized yet. ESPN notes that the Oak View Group, which is linked with Seattle's new ownership group, has already applied for a number of domains, which may offer clues to potential mascots. They range from the Seattle Kraken to the Seattle Sockeyes. Also on that list: the Seattle Totems, a throwback to another former professional hockey team to play in the city. The new franchise probably would do better to follow the example of the Stanley Cup-winning Metropolitans than the star-crossed Totems, though. After the team played for years in the minor leagues, the NHL offered the Totems an official expansion bid to jump to the majors in the 1970s — only to revoke the offer when the team's owners couldn't make its payments.